That's a swing of approximately 18%. According to FanGraphs, David Ortiz's grand slam was worth ~42% of the Red Sox single-game win probability in last night's contest. Simple multiplication would indicate that Papi's four-bagger was worth about 8% in World Series probability. That's a big swing for one... swing. Boston's victory is also bad news for both the St. Louis Cardinals and Los Angeles Dodgers, who fare much better in projections when paired with the lower-rated Detroit Tigers. 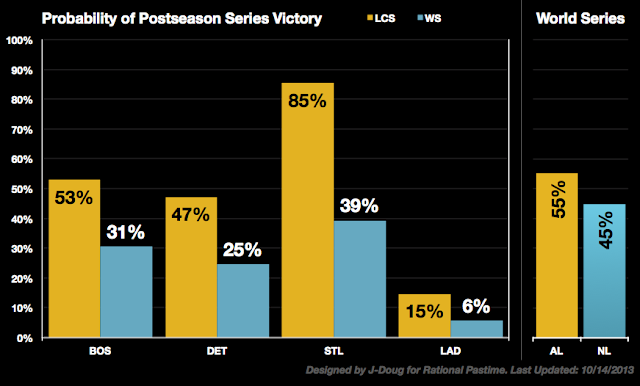 The comeback cost both teams about 1% of their World Series hopes. Read about LCS breakdowns and World Series outcome updates below. 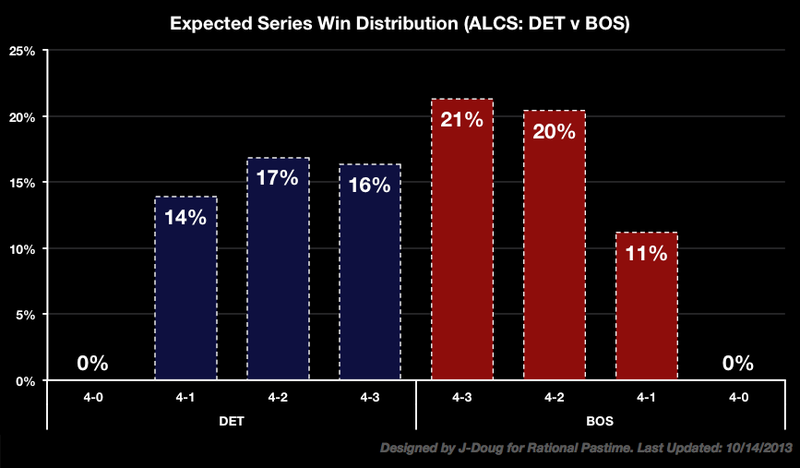 With their late-inning collapse, the Detroit Tigers once again fall behind the Boston Red Sox in LCS and World Series probabilities. 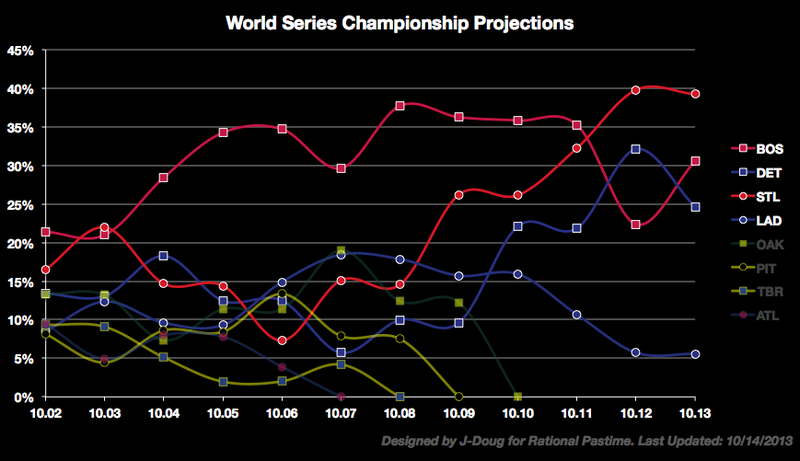 With a 53% chance to advance, the Sox are now expected to win the pennant in seven, followed by a victory in six. The Tigers' best hope is to win it in six. Tonight the NLCS will pick back up in Los Angeles with the Dodgers' backs against the wall. LA is facing scant 15% odds to advance with their best hope being a seven game series. 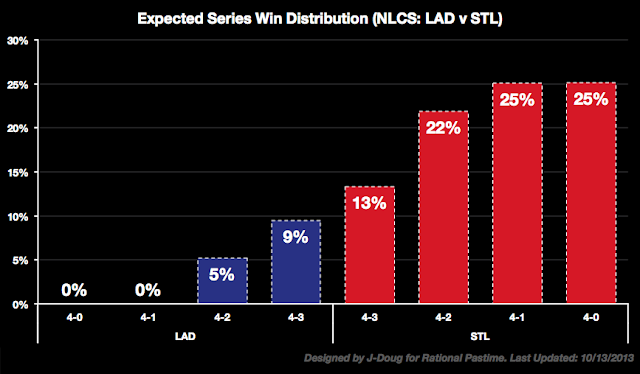 St. Louis is equally likely to sweep or win it in five. Both outcomes are individually more likely than any outcome that puts Los Angeles in the World Series. 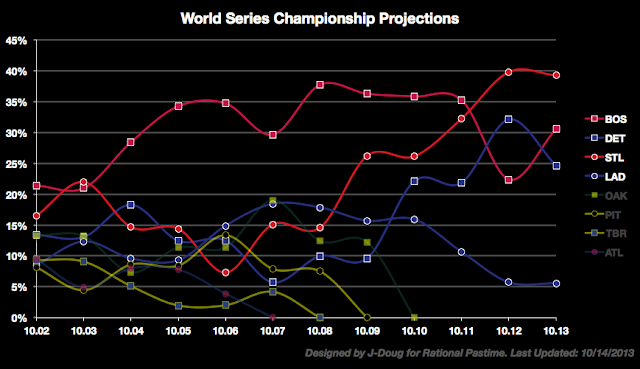 Boston's win put them back atop the World Series Outcomes leaderboard, resurrecting the earlier predictions of Sox over Cards in six or seven. Yesterday's top two projections, Detroit over St. Louis in six and seven, are now the fourth and third most likely outcomes, respectively. The rating system projected a Boston Red Sox victory over Detroit by a small margin, so the ratings didn't budge. Tune in tomorrow for the latest pennant and World Series probabilities following Los Angeles' first home game of the 2013 National League Championship Series.